Although Viquesney advertised his Doughboy as being available in cast bronze, none has ever been found that was actually made of that material; all were either made of stamped copper sheets, cast zinc, or stone. 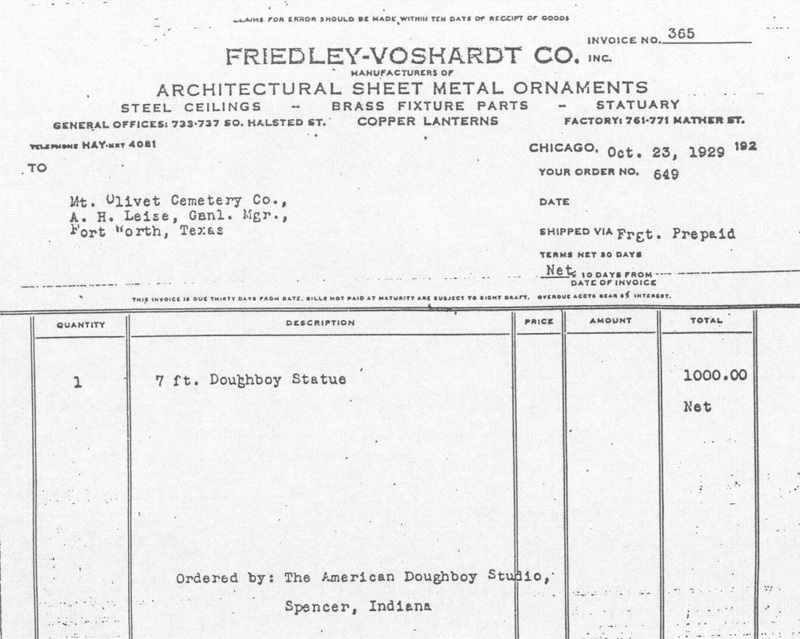 Below is an invoice from Friedley-Voshardt Company of Chicago, Illinois, the firm Viquesney employed to make the sheet copper version, acknowledging the order of a Doughboy for Mount Olivet Cemetery, Fort Worth, Texas. In mid-1934, Viquesney switched to Raphael Groppi Studios (below right). using them to produce his cast zinc Doughboys. Of interest below are two items that prove there was at least one serious attempt to continue Viquesney's business after his death in 1946. 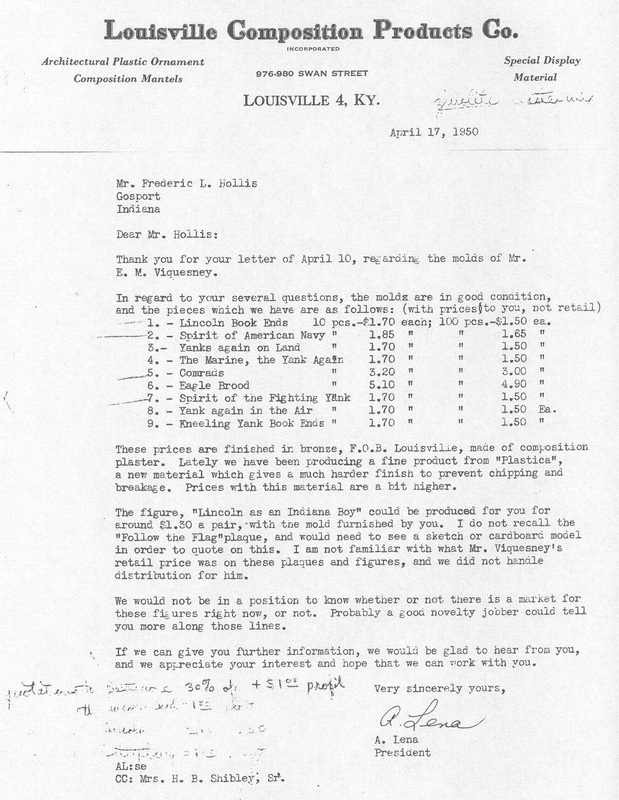 Although a man named Milton Waymire bought up all the remaining stock of Viquesney miniatures from a company called Louisville Composition Products just after Viquesney died (possibly with the thought of their being added to a planned Viquesney museum in Spencer, Indiana), it was a man named Frederic L. Hollis who continued to run Viquesney's business out of Gosport, Indiana for a few years. 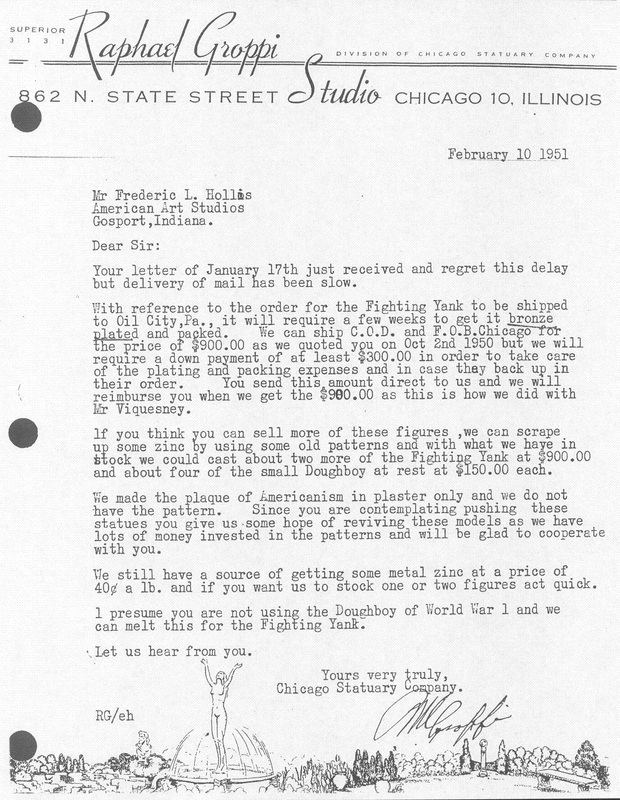 Two business letters, one from the Louisville, Kentucky firm mentioned above, and one from Raphael Groppi Studios of Chicago, Illinois, reflect Hollis' dealings in regard to Viquesney's miniatures and large monuments. Documents supplied by Carol Grissom, Smithsonian Institution.